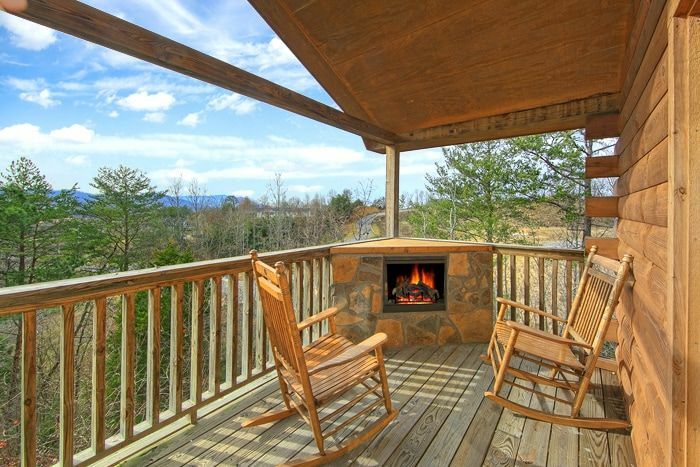 Experience romance at this Upper Middle Creek Pigeon Forge honeymoon cabin! 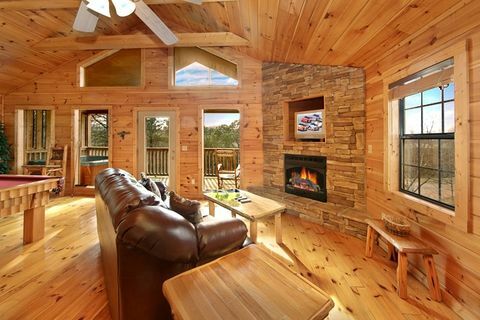 "Bear Tracks," a cozy, 1-bedroom cabin near Pigeon Forge, provides couples with 2 fireplaces, a hot tub, wonderful views, and lots of ambiance for that romantic retreat in the Smokies. 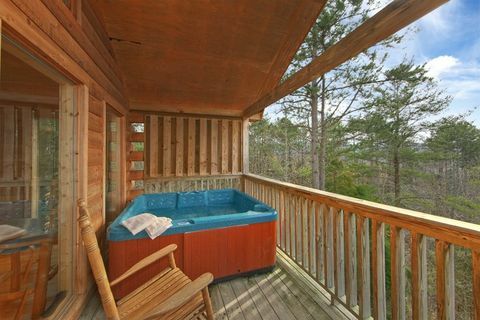 This Upper Middle Creek Pigeon Forge honeymoon cabin is the perfect hot tub cabin for two! Imagine the two of you relaxing in the large hot tub on the covered deck – both of you gaze at a gorgeous Smoky Mountain sunset as the deck's gas log stone fireplace lights each of your faces with its romantic glow. 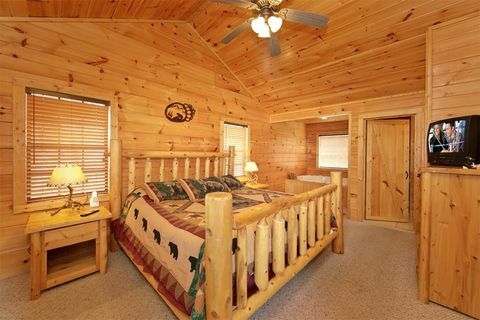 Indoors, this cabin's bedroom suite offers a king-size bed, private jacuzzi tub for two, and a television. The living room boasts another gas log stone fireplace for cuddling together during the cooler months. 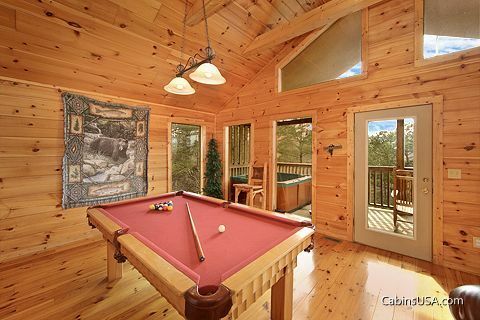 A full-size pool table and WiFi Internet provide entertainment for those rainy days spent indoors. 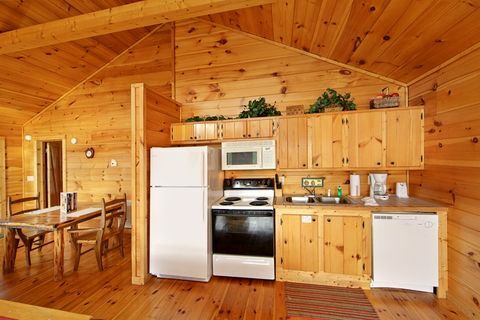 Your cabin's fully equipped kitchen is perfect for crafting culinary creations to impress your sweetheart . This romantic Upper Middle Creek Pigeon Forge honeymoon cabin conveniently places couples minutes from Dixie Stampede, Dollywood and dozens of other nearby attractions. Easy back road access to the Gatlinburg Glades Arts and Crafts Community, a great place to enjoy a relaxed shopping experience filled with unique, locally crafted gifts. 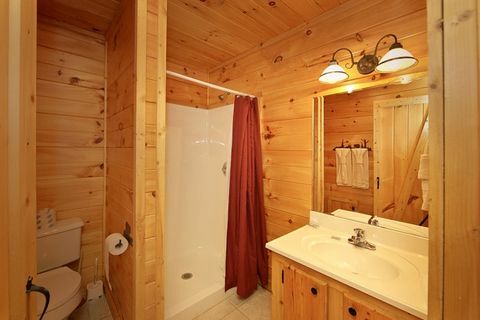 Book your Upper Middle Creek Pigeon Forge cabin online for immediate Online Savings and the opportunity experience romance in the Tennessee Smoky Mountains!